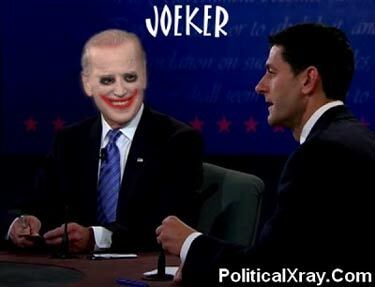 Joe Biden’s histrionic performance last night, consisting of mugging, smirking, sneering, laughing, muttering No!, interrupting, and continually visually manifesting condescension, contempt, and his disagreement with, and dissent from, Paul Ryan’s statements and position in the debate has provoked much criticism and, most interestingly, comparison with another Vice President, Al Gore’s, disastrous debate performance in 2000. Toby Harnden, of Britain’s Daily Mail, was one of many viewers who detected the presence of a ghost. [The] Ghost of an over-confident Al Gore will haunt smirking Vice President Joe Biden who tried too hard to make up for his boss’ weakness . . . and was caught fibbing about the U.S. intelligence community. Joe Biden came out swinging at Paul Ryan, flailing wildly and landing a few punches on his own jaw as well as his opponent’s. He showed the kind of spirit and populist anger that President Barack Obama was so conspicuously lacking and has cheered up many demoralised Democrats. But Biden’s performance here in Danville, Kentucky was both comical and self-defeating. Just as Al Gore sighed and rolled his eyes in 2000, so Biden smirked and guffawed. His brief was to show the aggression that Obama so obviously lacked when the President went up against Mitt Romney last week. But as the dust settles today many will be left feeling that he went too far, tried too hard. Many women and swing voters will have hated his condescending, swaggering display. Perhaps the even bigger problem the Obama campaign will have in the coming days is that Biden, again just like Gore in 2000, repeatedly exaggerated and mischaracterised for effect. And worse than Gore – who was caught in a series of small lies in 2000 – Biden was demonstrably untruthful in some big respects. The comparison with Al Gore’s smirking in the 2000 presidential debate with George W. Bush occurred to me as well, and I was sitting here wondering why it is that experienced professional politicians would make such an obvious blunder as to over-act so much during a debate that they injured their own performances and credibility. How could they both be so naive? I asked myself. Where does this impulse to so much dramaturgy come from? And, as I thought about it, it came to me. They are lying. They know that they are lying, and they are internally ill-at-ease because they know that they have nothing to offer but hot air. They are overacting because they are trying so hard to pretend, to pretend that it is all for real, that they believe in what they are saying. But they don’t actually, in their heart of hearts, really believe in the lines of guff that they are spinning, so they huff and they puff and they make faces at their opponents, desperately trying to persuade the audience of viewers to share their contemptuous dismissal of their miserable and unworthy opponents who dare to challenge the great and magnificent Oz! To pull this kind of thing off, you have to be incredibly talented at dissimulation, at pure acting, Gore and Biden are just not that talented, and as a result, they come across as over-acting hams. They cannot really conceal their own insincerity. To succeed at this kind of thing on this level of stage, you need to be Bill Clinton, and only one Bill Clinton comes along every century or two. Walter Russell Mead takes the occasion of Albert Gore’s latest climate jeremiad (in the latest issue of Rolling Stone, quoth Gore: In one corner of the ring are Science and Reason. In the other corner: Poisonous Polluters and Right-wing Ideologues.) to discuss why somebody who lives like Albert Gore cannot function satisfactorily in the role of prophet of Ecological Self-Denial. [S]ome forms of inconsistency or even hypocrisy can be combined with public leadership, others cannot be. A television preacher can eat too many french fries, watch too much cheesy TV and neglect his kids in the quest for global fame. But he cannot indulge in drug fueled trysts with male prostitutes while preaching conservative Christian doctrine. The head of Mothers Against Drunk Driving cannot be convicted of driving while under the influence. The head of the IRS cannot be a tax cheat. The most visible leader of the world’s green movement cannot live a life of conspicuous consumption, spewing far more carbon into the atmosphere than almost all of those he castigates for their wasteful ways. Mr. Top Green can’t also be a carbon pig. You can be a leading environmentalist and fail to pay all of your taxes. You can be a leading environmentalist and be unkind to your aged mother. You can be a leading environmentalist and squeeze the toothpaste tube from the middle, park in the handicapped spots at the mall or scribble angry marginal notes in library books. But you cannot be a leading environmentalist who hopes to lead the general public into a long and difficult struggle for sacrifice and fundamental change if your own conduct is so flagrantly inconsistent with the green gospel you profess. If the heart of your message is that the peril of climate change is so imminent and so overwhelming that the entire political and social system of the world must change, now, you cannot fly on private jets. You cannot own multiple mansions. You cannot even become enormously rich investing in companies that will profit if the policies you advocate are put into place. St. Francis of Assisi understood the point well. Taken by the Pope on a tour to see the treasures of the Vatican, St. Francis was notably unimpressed. “Peter can no longer say, ‘silver and gold have I none,’” smiled the Pontiff, referring to the story in the Book of Acts that recounts what St. Peter said to a crippled beggar asking him for alms. “Neither can he say, ‘rise up and walk.’” replied St. Francis — quoting what St. Peter said as he miraculously cured the beggar of his affliction. You can sit on ivory chairs with kings in their halls of gold, participating in the world of politics as usual, or you can live with the prophets and visionaries in the wilderness, voices of a greater truth and higher meaning that challenge the smug certainties and false assumptions of the comfortable, business as usual elites. You cannot do both. Al Gore cannot say “silver and gold have I none and no excess carbon do I spew,” and neither can he say to the paralyzed global green movement “rise up and walk.” He speaks, he writes, he speaks again, and the movement lies on the ground, crippled and inert. What this tells the skeptics is that Vice President Gore doesn’t really believe the gospel he proclaims. That profits from his environmental advocacy enable his affluent lifestyle only deepens their skepticism of the messenger and therefore of the message. And when they see that the rest of the environmental movement accepts this flagrant contradiction, they conclude, naturally enough, that the other green leaders aren’t as worried as they claim to be. Al Gore’s lifestyle is a test case for the credibility of his gospel — and it fails. The tolerance of Al Gore’s lifestyle by the environmental leadership is a further test — and that test, too, the greens fail. The average citizen is all too likely to conclude that if Mr. Gore can keep his lifestyle, the average American family can keep its SUV and incandescent bulbs. If Gore can take a charter flight, I don’t have to take the bus. If Gore can have many mansions, I can use the old fashioned kind of shower heads that actually clean and toilets that actually flush. Al Gore looks to the average American the way American greens look to poor people in the third world: hypocritically demanding that others accept permanently lower standards of living than those the activists propose for themselves. I am not one of those who thinks him a hypocrite; I think rather that he shares an illusion common amongst the narcissistic glitterati of our time: that politically fashionable virtue cancels private vice. The drug addled Hollywood celeb whose personal life is a long record of broken promises and failed relationships and whose serial bouts with drug and alcohol abuse and revolving door rehab adventures are notorious can redeem all by “standing up” for some exotic, stylish cause. These moral poseurs and dilettantes of virtue are modern versions of those guilt-plagued medieval nobles who built churches and monasteries to ‘atone’ for their careers of bloodshed, oppression and scandal. 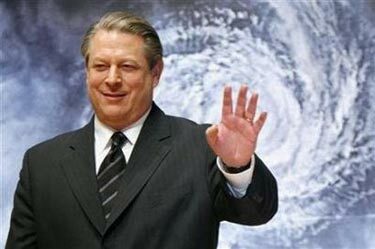 Mr. Gore is sincere, as the fur-fighting actresses are sincere, as so many ’causey’ plutocrats and moguls are sincere. It is perhaps also true that the fundraisers who absolve them of their guilt in exchange for the donations and the publicity are at least as sincere as the indulgence sellers in Martin Luther’s Germany. Mead does not stop, unfortunately, to observe that the perils of alleged Climate Change are just as far removed from diurnal reality as the theological perils of Christian hellfire. Earlier this week, Al Gore identified the reason we’ve been experiencing a bitter-cold, snow-filled winter recently. Charles Krauthammer is clearly the winner of the subsequent week-long competition in ridiculing Gore. Warmlist needs a new category for satirical proposed additions. The National Enquirer says Al Gore’s alleged victim has DNA samples, video evidence and witnesses. She is telling all, and describes Gore as “a sexual predator.” That means that Al Gore really did have essentially everything in common with his running mate. Andrew Bolt, at the Herald Sun (Australia), has a great deal of fun reporting on an item recently issue published in New Scientist exploding one of the best known Warmist disaster memes. How embarrassing. Global warming worriers have gone from warning Tuvalu will drown to wishing it damn well had. But look at it now. Not drowning, but waving. And, er … growing too? You remember Tuvalu, of course, even if you’ve never figured quite where it was. For years this glittering string of atolls has been shoved in your face as the poster islands of the global warming faith – this Eden we were killing with our Western sin. How often we were told it could be the first Pacific nation to be swallowed by the rising seas caused by our evil gases. As a British judge later ruled, there was no evidence of climate refugees from the Pacific having to be evacuated to New Zealand or anywhere else to escape rising seas. But truth has counted for dangerously little in this debate, and warmists told one Tuvaluan tale after another of an endangered Polynesian paradise that grew steadily more mythical. I mean also that warmists felt entitled to invent complete fantasies for the cause. Take Prof Mohammed Dore, an environmental economist from Canada’s Dore University, who three years ago declared Tuvalu uninhabited already. “In fact, there is an island called Tuvalu which was completely evacuated and New Zealand accepted all the residents because of sea level rising,” he wrote, much to the surprise of the island’s 12,000 residents, who have actually doubled their number in the past three decades, there being little else to do in the middle of the ocean. And that’s their real problem. Surrounded by nothing but coconuts and fish, and with no employer other than the Government since the Nauruan phosphate industry died, how were they to get on in this great world? What luck! Along came the global warming faith, and Tuvaluans must have seen in this greatest cargo cult of all a chance at last to earn a dollar – and maybe even get a visa to a new home in a richer land. So I wasn’t surprised that Tuvalu’s prime minister in 2003 went to the United Nations to present a bill to the guilty Westerners he insisted were causing the seas to drown his home. And the thick really laid it on here. Whole institutions were devoted to preaching – especially to children – that wicked Westerners were drowning the homes of innocent islanders. Take professional warming alarmist Rob Gell, the TV weatherman, who in 2008 launched an exhibition at Melbourne’s Immigration Museum dedicated to convincing the gullible that we should take in all these soggy Tuvaluans before the waves lapped over their heads. It was virtually a “foregone conclusion” that Tuvalu would be uninhabitable “within the next 50 years”, he claimed. Naturally, Labor signed up to the scare, this being when it still believed man-made warming was “the great moral and economic challenge of our time” – a challenge so moral that any lie could be excused. It even produced a “Pacific climate change plan” which promised help to global warming “refugees” as they fled low-lying island states such as Kiribati, the Marshall Islands, and Tuvalu. All of which culminated in the tearful plea from Tuvalu’s delegate, Ian Fry, at the UN’s great warmist gathering at Copenhagen last year – a performance that in every comic respect showed the sham behind the warming scare. Cut your gases, or we die, he sobbed. Wonderful stuff! The crowd went mad with applause. Yet all this, too, was as fake as Al Gore. Fry is not from Tuvalu, has never lived there, and is not threatened by any rising seas, since the Queanbeyan home of this part-time Australian National University student is 144km from the nearest beach. And now we know that Tuvalu, far from drowning, is rising from the seas. It was already clear from the Australian-funded South Pacific Sea Level and Climate Monitoring Project that sea levels in the region were rising only microscopically, much as they’d done for centuries before the invention of the motor car or the light bulb. BUT now New Scientist reports that however fast the seas are rising, Tuvalu and many other low-lying Pacific islands are so far rising even faster, thanks to coral debris, coral growth, land reclamation and deposits of sediment. Some have grown by as much as a third. Auckland University’s Associate Prof Paul Kench, one of the two authors of the study, said he compared historical pictures from the past 60 years to satellite images of 27 Pacific islands. “Eighty per cent of the islands we’ve looked at have either remained about the same or, in fact, (grown) larger,” he said. In the Spectator, epidemiologist Paul Reiter debunks the “malaria spreading because of Global Warming” meme popularized by Al Gore, and explains how the repetition in print of empty assertions by small groups of activists can effectively promote complete falsehoods into established fact. In his serious voice, Mr Gore presented a nifty animation, a band of little mosquitoes fluttering their way up the slopes of a snow-capped mountain, and he repeated the old line: Nairobi used to be ‘above the mosquito line, the limit at which mosquitoes can survive, but now…’ Those little mosquitoes kept climbing. The truth? Nairobi means ‘the place of cool waters’ in the Masai language. The town grew up around a camp, set up in 1899 during the construction of a railway, the famous ‘Lunatic Express’. There certainly was water there — and mosquitoes. From the start, the place was plagued with malaria, so much so that a few years later doctors tried to have the whole town moved to a healthier place. By 1927, the disease had become such a plague in the ‘White Highlands’ that £40,000 (equivalent to about £350,000 today) was earmarked for malaria control. The authorities understood the root of the problem: forest clearance had created the perfect breeding places for mosquitoes. The disease was present as high as 2,500m above sea level; the mosquitoes were observed at 3,000m. And Nairobi? 1,680m. These details are not science. They require no study. They are history. But for activists, they are an inconvenient truth, so they ignore them. Even if Mr Gore is innocent, his advisers are not. They have been spouting the same nonsense for more than a decade. As scientists, we have repeatedly challenged them in the scientific press, at meetings and in news articles, and we have been ignored. In 2004, nine of us published an appeal in the Lancet: ‘Malaria and climate change: a call for accuracy’. Clearly, Mr Gore didn’t read it. In 2000, I protested when Scientific American published a major article loaded with the usual misrepresentations. And when I watched his animated mosquitoes, his snow-capped mountain was oddly familiar. It took a few moments to click: the images were virtually identical to those in the magazine. The author of the article, Dr Paul Epstein, features high in Gore’s credits. Dr Epstein is a member of a small band dedicated to a cause. And their work gains legitimacy, not by scholarship, but by repetition. While they publish their work in highly regarded journals, they don’t write research papers but opinion pieces and reviews, with little or no reference to the mainstream of science. The same claims, the same names; only the order of authors change. I have counted 48 separate pieces by just eight activists. They are myth-makers. And all have been lead authors and/or contributory authors of the prestigious IPCC assessment reports. Take their contention, for example, that as a result of climate change, tropical diseases will move to temperate regions and malaria will come to Britain. If they bothered to learn about the subject, they would know that in a period climatologists call the Little Ice Age, when Charles II held ice parties on the Thames, malaria — ‘the ague’ — was rampant in the Essex marshes, on a par even with regions in Africa today. In the 18th century, the great systematist Linnaeus wrote his doctorate on malaria in central Sweden. In 1922-23 a massive epidemic swept the Soviet Union as far north as Archangel, on the Arctic circle, killing an estimated 600,000 people. And malaria was only eliminated from the Soviet Union and large areas of Europe in the 1950s, after the advent of DDT. So it’s hardly a tropical disease. And yet when we put this information under the noses of the activists it is ignored: ours is the inconvenient truth. the Archives of Never Yet Melted in the 'Al Gore' Category.